But, we can make hypotheses about the state of software testing, based on where the industry has been headed and thanks to some of the industry experts who devote themselves to modernizing and advancing the profession. Here is what they’ve said! What Will Be the Toughest Obstacles for Test Teams in 2019? Okay, you got us Janet—that’s a badly worded question—but you know what we mean! “I still see too many teams, even so-called agile teams, that still silo their testers, even if technically they’re on a cross-functional team. The dev team operates in a mini-waterfall fashion, doesn’t let the testers participate in planning discussions, doesn’t collaborate with them to test as they code. The stories for the iteration are thrown over the proverbial wall the day before the end of the iteration. I’m not sure why so many teams are stuck in these old ways which never really worked well. Even back when waterfall was feasible from a competitive point of view, projects only succeeded when testers were involved from the initial analysis and design phases and all the way through coding. What Will Be the Most In-demand Testing Skills in 2019? “There are many skills that are needed, but I think testers need to understand their context. For example, if they are the only tester on a delivery team, they will definitely need to learn teaching skills – how to share some of their testing knowledge with the rest of the team. Or, if they are working with a data warehousing/business intelligence team, they may need to learn a lot more about data integrity and data science. “It is hard to say what skills will be in demand in any given year, as the market, technology and frameworks have been changing at a rapid pace. Before a person learns about one technology/framework there is another one which pops up and this cycle is endless. So, what I would say is, as testers we need to be curious and open minded in adapting to change, learn and read about the latest trends in technology and be ready for whatever comes in our way for testing. What Tools or Methodologies Are You Excited to Understand Better This Year? “I’m not sure there is a new methodology around, but I’d like to explore a bit more about quality and what it means to different teams. For example, there is a difference between product quality and quality of your process and many teams get confused in what they measure. Also, there are different points of view in how we perceive quality of our products. What Are the Best Upcoming Conferences Testers Should Attend? “I may be a bit biased here, but my favourite is the Agile Testing Days conferences – this year, the North American one is in Chicago. Their talks are not only about testing – which is one of the reasons I like the conference – so many choices so attendees are exposed to different ideas. There are also great social activities, and the conference really makes an effort to provide an environment for people to talk with each other. “The STAREAST and STARWEST conferences are always worth attending for any tester. This year, I would also recommend Atlassian Summit as an interesting conference not only for testing but also for gaining a deep understanding of the other roles in software development. “Next month I will be at European Testing Conference, it’s one of my favorites because it is inclusive of everyone interested in testing and quality, whether or not they self-identify as testers, so it’s a diverse group. There are lots of opportunities for informal conversations and meeting new people. All the workshops are presented twice so there’s more opportunity to get to the ones you want! In March I’ll be at BoosterConf in Norway, again quite inclusive of all roles and specialties in a software team. There are sessions to help improve both on the tech side and the culture and people side. I won’t make it to any TestBash conferences this year but I do highly recommend them – a welcoming, energetic community. I’m super excited to be able to participate in TestingUY in May! I’m lucky to know several testing practitioners from Uruguay and it sounds like an amazing community. There are a lot of exciting testing communities in South America, lots of innovation there. Agile Testing Days USA and Agile Testing Days Germany are of course among my favorites. This will be my 11th year at Agile Testing Days Germany. It’s a wonderful community where people make lasting relationships and continue to help each other beyond the conference. I attended my first CAST last year, another one with similar benefits to Agile Testing Days, European Testing Conference and TestBash. It’s a smaller conference where you get the chance to talk to people outside of the sessions as well as high quality content. It will be in Cocoa Beach in Florida again, that is the Space Coast, and you can see rocket launches from the beach at night from the nearby Space Center! At Abstracta, we are looking forward to taking on exciting new projects with current and future clients, helping organizations and testers enhance their automation efforts, watch the use of AI in testing grow, break the barriers between development and testing, and attend conferences, especially the one we sponsor each May in Montevideo (our hometown), TestingUY, the largest testing conference in South America! 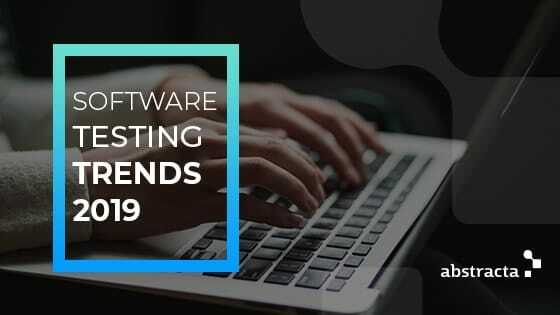 Tell us, what will be some of the biggest software testing trends in 2019? What do you hope this year will bring? We Want Our DevOps Venn Diagram Circle Back – Plus One! Very informative, most importantly the Gregory comment on the toughest obstacle for the test team. In my opinion, a tester should be part of each phase from the beginning (Requirement gathering) to the end (deployment). Worth reading! Very useful blog article with the questions to understand the state of software testing from the point of view of five industry experts most importantly the comments on software test automation and their take on software testing trends in 2019. Thanks much for sharing!